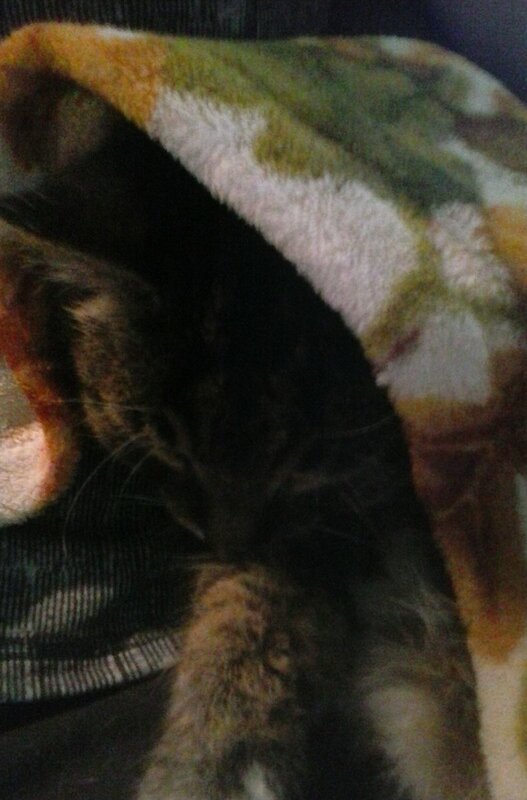 Almost 80 degrees and Tiger wants to snuggle with me in a blanket. Today’s post is a bit different than usual. During my Tuesday morning Bible study, my cat looked so comfortable snuggled up on my lap that I spent some extra time meditating on the Word. I’d been in Genesis writing about our Creator, and a thought popped into my head. I want to share this idea with you today and ask for feedback. Please comment! Diving deeper into God’s mysteries shouldn’t be done in a void — I believe God wants us to grow together and “sharpen” each other (and also to call each other out if we notice someone studying something that’s not in line with scripture). Okay, so we know that God has had a plan in mind since before creation and that plan involves building a family (Eph.1:3-6). We also know that the church is described as the bride of Jesus Christ (2 Cor. 11:2; Rev. 19:6-9) and we’re told that human marriage is a “great mystery” that points to the relationships between Christ and His church (Eph. 5:22-33). What if God began revealing these aspects of His plan from the very beginning in the way He chose to create man and woman? 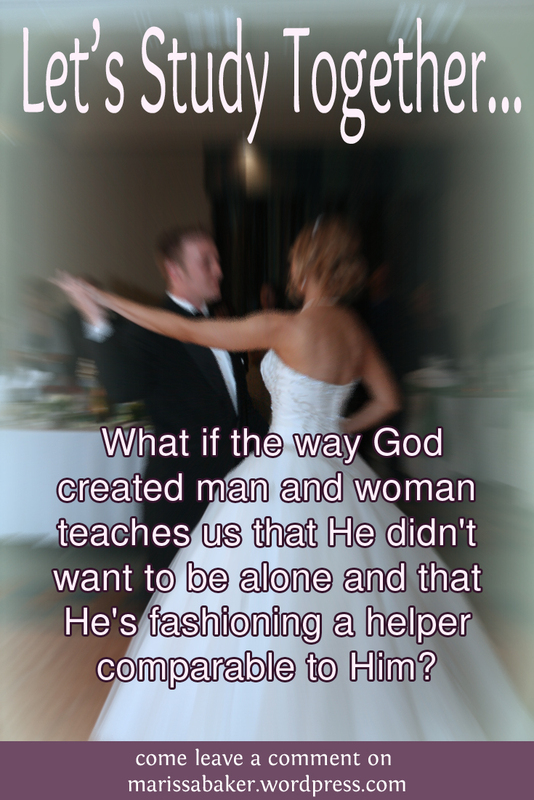 or, to put it another way, what if the way God created man and woman teaches us that He didn’t want to be alone and that He’s fashioning a helper comparable to Him? Man and woman could have been created at the same time, but God did something different. First He “formed man of the dust of the ground, and breathed into his nostrils the breath of life” (Gen 2:7). Then, God put man “in the garden of Eden to tend and keep it” and commanded him not to eat of the tree of the knowledge of good and evil (Gen. 2:15-17). God would have known He was planning to create Eve as well as Adam, so why leave man alone long enough to put him in the garden and have him name all the animals? Was it to give the man a chance to realize what God already knew, that it is not good to be alone? We know very little about the universe before God created the earth and set His plan involving man in motion. We know the Word and God were together, and we know there were angels. We also know that these two God-beings wanted to increase the size of Their family so much that the Word was willing to come to this earth and die to get us there. Would it be too much of a stretch to say that God had decided “it is not good that We should be alone”? Woman was created from Adam’s rib, not formed out of the dust as he was. They weren’t created separately from different sources — they were literally one flesh. You might say Eve was made in Adam’s image, and that every person after has also “borne the image of the man of dust” (1 Cor. 15:49). A compatible mate needs to be fashioned after the pattern of her bridegroom. Is that what the Father and the Word were doing when They decided, “Let Us make man in Our image, according to Our likeness” (Gen. 1:26)? Could we say that God, from the very beginning, planned to fashion “a helper comparable to” Himself? The Rabbi in my messianic congregation was talking about this — being Yeshua’s “help meet” (Hebrew, ezer kenegdo) — just a few weeks ago. That phrase in Genesis 2:18 could also be translated, “I will make for him a strength equal to and adequate for himself.” Eve was to be doing the same things as her husband and filling a vital role, though she wasn’t over him in authority. We’re made in the image of God and we’re meant to “bear the image of the heavenly” just as we’ve born the image of the man of dust (1 Cor. 15:42-49). Could it be that God is calling us to be a strength and helper alongside our Bridegroom Jesus Christ, standing with Him and building up the kingdom? Is that what Jesus was telling us when He said, “The kingdom of heaven is like a certain king who arranged a marriage for his son” (Matt. 22:1)? Is that what They were pointing to when They made man and woman the way They did? What do you think? Does this interpretation line up with other scriptures? add a deeper layer of understanding? help us draw closer to our Lord? Leave a comment and let me know what you think, and what you’d add, change, or clarify. Let’s study this together! My first thought is to remember that God is not inadequate and does not need to be completed, and it can lead to and inflated view of our importance – God is granting eternal life as a gift, not to somehow “help you, help me”. But I appreciate the tie in of Jesus’ parable, and it ties in with the marriage supper in Revelation. I just noticed that it doesn’t say “wedding supper” – the one time festivities, but “marriage,” which is the life together that begins after the wedding. Yes, that’s definitely something to keep in mind and I’m so glad you added it. It’s not that God “needs” us, but rather He wants us and is giving us a gift. And for the Bride/church to be compatible with her Bridegroom we need transformed by that cleansing and sanctifying it talks about in Ephesians 5 with Christ washing the church so He can present her to Himself. Thank you so much for your comment! (and for pointing out the marriage/wedding difference — I hadn’t thought about it in this context). Yes, I was going to say the same thing as Kayla. God existed an eternity before man was created and does not need anything from us. He would have been completely awesomely God without us. His creation and redemption was out of complete love not need. God could do everything that we do in the Kingdom better, quicker and cleaner in a moment, He just allows us the privilege of participating for our benefit not His. We are the Bride of Christ as a church and the Body of Christ as a church and brothers and sisters of Christ individually, but I don’t believe there is any equality or necessity meant in those roles. And mystery in the New Testament is not used like we would use the word now – as a secret that needs to be found out but rather is setting out a revealed truth of God that was not known to the Old Testament saints. So when Paul says I show you a mystery, he uses mystery 21 times, he then goes on an talks about the subject explaining the hidden truth that we know know through Jesus. I do agree that there is a lot of intentional structure in Adam and Eve’s creation for us as followers of Christ, married couples and our realtionships within the church. I’m glad you and Kayla both brought this up. It’s making me think about the difference between “need” and “want.” Like Kayla said, God doesn’t need us to complete Him. The fact that He created us and set up the plan to make believers part of His family says He wants us, though. That’s such an incredible blessing! to be wanted by the all-powerful creator of the universe who doesn’t need us and yet loves us anyway. And I definitely agree with your point about not being the equal of Christ. Even when John says (in 1 John 3) “we shall be like Him” in the future it’s not about being on the same level as God, but more about being made similar to our Father because He chooses to give believers the gift of eternal life and make us His children. It’s not being “equal” but rather being made a “compatible” Bride that can work with her Bridegroom in the future and to a certain extent in the world today as His body. Thanks so much for commenting and prompting me to consider this subject more deeply.